Oh dear! What to do if you hit one. | Shared Alliance Insurance, Inc.
Oh dear! What to do if you hit one. Stay calm. If possible, pull over to the side of the road, and turn on your hazard lights. If you must leave your vehicle, stay off the road and out of the way of traffic. Call the police. 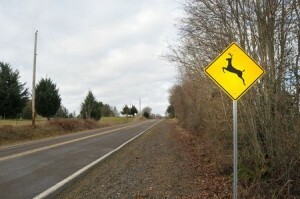 Let them know if the animal is blocking traffic and posing a threat for other drivers. If the collision results in injury or property damage, you may need to fill out an official report. Document the incident. If possible, take photos of the roadway, your surroundings, damage to your vehicle, and any injuries you or your passengers sustained. If witnesses are involved, ask them for a written account and their contact information. Stay away from the animal. Even an injured one can attack. Double-check that your car is safe to drive. Look for leaks, loose parts, tire damage, broken lights, etc. If you have any doubts call for a tow. Contact your insurance agent. The sooner you report the incident, the sooner your agent can file and process your claim. Knowledge is power, as they say. Keep calm and drive on! "We transferred our policy from GA to SC and found a few problems in the changeover. However, thanks to Shared Alliance, they helped us start a new policy. We have been very satisfied with the results. Thank you, Shared Alliance, for being there for us!"